Perfect weather for a ride into town. A magnificent array of ER contenders waiting for the bazz at Gordon. Satnav killing his PBs on the 4 gorges. Rolling through North Sydney at 30kph..nearly a clean sweep..
B&T on form, fast and loud. Many happy returns planned for the usual times. This entry was posted in Commute Reports on 27 September 2012 by BT. B1c was in charge of the roll call at St Ives – Wilson, Dobbo, Tony, Herb and YHC all present and correct and on the pedals at the stroke of 5.30am. All very organised including a list! Good time was made up Mona Vale to Forrest Way, Michael we looked for you and crystal cranked up to McCarrs but not sighted, hope all ok? Based on this morning’s pace if anyone is thinking of joining the bunch at the Forrest Way intersection 5.39 am is probably a better time to be ready for a 5.40am rollout. The bunch kept tight through Akuna, all enjoying B1c’s musical app recently downloaded to his Garmin 500, a great innovation but they need to provide some more songs if it is going to catch on. In the end Dobbo and Wilson could stand no more and sprinted off the front with the West Head turn in sight, I think Dobbo may have clinched the honours. Re grouped in the now usual spot for a bit of brekkie, subject to planning there is real potential for a coffee shop at the West head turn, before enjoying the spin down and through to Church Point and Pittwater Road. A car free run down the spit and then a Herb towed YHC up the next hill, dropping said 3 peaks veteran in the process- thanks mate, even got a PR so be aware next time you will have to work a bit harder. Trouble free through the lower north shore rat run, plenty of water on the roads by this stage but our weather could not have been better, before joining the main OTP group as they ordered their second hit of caffeine. This entry was posted in Commute Reports on 27 September 2012 by Schleck. A dull overcast this morning made for a grey somewhat chilly dawn. Jumping into the Subaru and away, there was a sudden rush of blood to the head and I found myself parking off Fox Valley just for the extra warm up required…Teff was already at the ER bus stop once I had geared up, and soon there was Ravi and B1c for a small if not perfectly formed groupetto ready for the second best way. Mike had a few chosen words about the tight fit of the Continental Gatorskin..which was met with some suggestions about using lube and a little more force. Tef actually puts his on an old rim for a day or two first..anything to stretch it so that you can be swift at the side of the road. Rolling into the Gordon bus stop, and onto what is now becoming a normal 15 to 20 odd riders…I say odd …some wearing superman socks with open toed sandles..some on MTBs others on vintage steel antiques..( and old bikes too ) . The peloton took off in two by two order, similar to what a real peloton should look like, a formation that lasted all of about 100m ..although it was generally narrower than normal, the hills of death , Lindfield , Chatswood all traversed with style and aplomb…Tindale and KOM…( deep inhale and …) the party line is we take it real easy on the SUP as plenty of traffic at this time of year makes for a dangerous potential accident..YHC can remember last year seeing a lot of blood on the ground and paramedics attending some poor gentleman in the dip before the KOM.. not having any fun at all.. This morning we missed a similar incident by a gnats whisker..so please all take more care especially where speed and surface are concerned..the oncoming traffic cannot stop in the dip and there are usually leaves and debris on the corner at the bottom of the dip. In aviation terms this would be called an “Incident” and the man from CASA investigations would council all parties concerned and remove a license or two pending a review of training and perhaps require a new examination by a testing officer. Luckily all you have is a RANT about safety. The Burlington sprint …” no speakies “ was all Bullet could manage having turned a short section of road into a window of the vision splendid..a dark tunnel with blinding light ..not quite ready to step across the void he chose to turn away…and rejoin the living, but with that ethereal look of someone who has just had a near death experience. All good for a scheduled on time departure this evening, it seems the 6ers have been getting more popular, making the return almost as much fun as the commute in. This entry was posted in Commute Reports on 25 September 2012 by BT. I like to get into things. Obsessed some say, but I prefer to think of it as enthusiastic. 2. What got you into cycling? My brother and I rode bikes everywhere as kids — to school, to squash on the weekends, to friends’ houses, towing skateboards, to work. What really got me into cycling was the idea that a bike could take me anywhere. I was 16 when I talked my brother, cousin and mate Wayne into riding with me from Katoomba to Kiama — “it’s all downhill” — took us three days. Later (mid 90s), a very nice policeman helped me back into cycling after stopping to admire my car. That six month driving suspension resulted in a commute between Ashfield and North Ryde on an incredibly heavy Shogun rigid-fork MTB. A few years later I bought a Giant ATX 890 aluminium hardtail, rode all over the blueys, and started a long, solo commute between Avalon and North Ryde via Church Point and McCarrs Creek Road, 40 kms each way. Nearly killed me the first day. Took 3 hours — I was an hour late for work — sat at my desk in a daze and got a lift home with a mate. 3. How did you come to join the Easy Riders? Started riding again in January this year after about 15 years. Was gasping and wheezing up the highway one afternoon when Sat Nav cruised past and tried valiantly to strike up a conversation. In the end he handed me a card and I looked Easy Riders up on the web. Rhodes run the next day, and ridden pretty much every (work) day since. 4. Tell us about your bikes. Speedwell Scout 24 (1975). I really wanted a Dragster but Dad insisted on “proper” bikes. I think that thing was made out of solid steel rod. The trusty Bennett Super Sports (1979), faithful servant for many years, long since retired. I pulled my brother’s bike out from under Mum and Dad’s house after 25 years at Christmas this year, pulled it apart, painted it, put it all back together again and set out on the one true path. In the meantime, there was that Centurion rigid fork MTB (stolen from the car park at work) and the Giant aluminium hardtail (stolen from the garage at home.) The Peugeot was sitting under a work mate’s house for 20 years or so. Pulled that apart, cleaned it up and replaced a few bits and pieces. We’ve done over 3000 kilometres together since July. 5. If you could ride anywhere in the world, where would it be? New Zealand. Wait, Moab. Or Marin. No, no, the Pyrenees and the Alps. The Dolomites? Canada! Arg. Yes please, I would like to ride anywhere in the world. 6. Tell us a riding story. I’d had my shiny new Bennett for about a week, so I was fifteen years old and riding for the first time with gears: belting down my road flat out in top, pedalling furiously along the main drag then swooping in and out of the side streets. I felt like I was flying, until a bloke drives past and yells at me — get off the road you idiot, or words to that effect — my first GOTF token, which he delivered along with an empty beer can, I guess to emphasise his point. 7. Do you have any advice for the riders at the back of the ER peloton? Um, it’s quite nice at the back of the peloton. Otherwise, ride home with Clutters and Bam Bam. 8. Lastly, tell us something we don’t know about you. I once presented on stage with Bill Gates? Or, I like climbing things too — this is Mt Aspiring in New Zealand. This entry was posted in Rider of the Week on 24 September 2012 by Drastique. I’m a qualified tradie. An electrical fitter. NB: I do not own a ute. I changed from the Electricity Supply Industry to Banking IT about 17 years ago. I apply electrical circuit theory to business processes and computer systems to make them work. Mix in a modicum of engineering rigour and some analytical pisaz and I can usually find a way to have some fun working with the mundane. I like outdoor endurance type sports like bushwalking, kayaking, back country (and alpine) skiiing (see below). Cycling fits into that pretty well. One of my all time favourite holidays was a 10 day back country ski trip through the middle of the Kosciusko National Park. In my late 20s, I climbed a Himalayan Trekking peak called Mera Peak (6800m). That was seriously hard yakka. After that, other physical challenges are shorter and hopefully as much fun. I have a broad taste in music and have recently seized upon Jazz after listening to my boys play in some very good school jazz bands. I have ridden short distances on and off over the years, mainly as a way to wear the kids out on the weekends. Dragon talked me into the Gong Ride last year. Reckoned I’d have to train for it by riding to work. I did the Spring Cycle standing on my head (and so did the kids), the Gong Ride couldn’t be that much harder, could it? I started riding a “safe” route which we know as the Epping Chapter today. While the route was fairly traffic free, it involved two crossings of Browns Water Hole and Rothwell Ave (22%) each day. After the Gong Ride, I kept riding a few times a week. Eventually, I was persuaded to buy a “proper” bike, the Aluminium Giant I have now. I had just started riding the “proper” bike and was looking for a route that was shorter and less demanding than Epping/Browns when I bumped into SatNav at the SSHB. He sold me on the OTP, and the rest is history. I have an old MTB I gained from a friend who left it to me as payment for things I bought for him while he was sailing a small yacht around the world. I used it for ages to take the kids shopping with a Tag-Along. I used that bike on the Gong Ride. My wife found a T bar thing on the footpath in a Council Cleanup. It worked and has skinnier tyres than the MTB, so I started riding that. Some of you will have seen it – described as my paddock basher. Weighs 15kg like the MTB. I have an Aluminium Giant Defy I. The one most of you will have seen. Much lighter than the other two. I’m concerned I’ll wear it out pretty quickly clocking up over 1000 km a month. Riding around Sydney is growing on me. It doesn’t scare me as much as when I first started. Should I still be scared? OK, I’m still scared, I started off terrified. The Red Flag event from Merimbula to Mt K is most appealing. As a skiing nut (see below), I like alpine style challenges and that ride certainly does it. 6, Tell us a riding story (or two). About 20 years ago, I did an over-night riding trip with an outdoor group called SPAN. (Doesn’t stand for anything. Means unlimited SPAN of activities.) It was four days in the Barrington Tops. The biggest hill was 1300m straight up. Had to push the bike up over your head while on foot. Jam the brakes on. Take two steps up. Repeat. The ride down was worth it. I fell off going over a causeway in soft mud. I did well lining up a touchdown on some soft greenery on my back. Perfect flat landing skidding along a bit so that my tee shirt rolled up my back exposing it fully – to the stinging nettles – the green. The pain was – well. So I just got back on the bike and rode off without a word – what could I say? Another story: I was holidaying with our kids on a farm near Gloucester. I had the Tag-Along and took Keith for a Climb up Tipperary Mountain. It was up a very steep dirt road. As we approached a high ridge, a storm broke with thunder, lightning and horizontal rain. (Keith was 4 years old.) I thought “He won’t like getting too wet, so we’d better head back.” I took the direct route down, knowing it was fairy safe, having driven it in a Land rover previously. The grass was about 2.5 feet tall. This made for a relatively slow descent. But the grass was hiding all the cow pats which were slippery and sprayed up every where. The descent was so steep I had to hang off the back of the bike, as you do on steep stuff. The rain was pelting in so that we were soaked on just one side. Somewhere on the way down, one of the buttons on my shirt popped, allowing the bike seat to get into the front of my shirt. When we got to a flat bit near the bottom, I found I was stuck hanging out the back of the bike with the seat jammed inside my shirt. While this was happening, Keith was yelling “Yeee Harrr! Hey dad, get your wet bottom out of my face.” at the top of his voice. It’s like when you are skiing (see below) in a white out. If the guy in front suddenly disappears, you know its time to stop or take evasive action to avoid that cornice or white ute. You only get that by riding at the back. I believe back country skiing is the second best way to start the day – you know – snow camping. The breathtaking scenery, the need to get moving fast so you can warm up in the morning, the exhilaration of going so fast with such little effort. Skiing in Sydney is a bit hard. Bike riding is a very good proxy. This entry was posted in Rider of the Week on 23 September 2012 by Drastique. 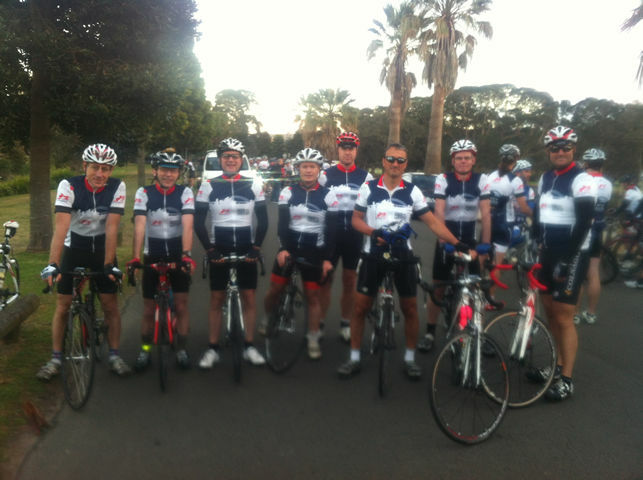 A quick report from yesterday’s annual Bowral ride run by Sydney Cycling Club. 4.40am the first time check of the day, with six ER’s (Wilson, Stealth, NNNick, Schleck, Phantom and myself) loitering with intent at Gordon for the heart starter to Centennial Park, with Andy, Graham, Zlatko and VD boarding the rattler at Turramurra. Various forms of nightlife in various states of disrepair on our way through Oxford St made us all wonder what it was like to be 40 again…..
All arrived and accumulated in good order at Centennial Park, where the Dominator awaited, together with Chindo and new ER Michael (Phantom’s intro). “Strong as an ox” described Phantom, which proved to be a fair assessment. Welcome mate. Choice between B1 and B2 (not Mike and Chris, but groups) made all the easier given the B2 support vehicle was more like a mini than the van that supported B1, so we flocked to the latter for the briefing. 22 in B1, a good choice. The standard SCC rolling paceline was prescribed – “roll off the front to the left etc etc” – better in theory than in practice unfort. Our leaders were Fran and Dan. Introduced by (someone we assumed to be) Jan. Stealth instantly won the hearts and minds of the SCC members with “don’t you just love these made up names”. The Pinarello crowd which formed the majority of the ER group compared notes as to where they got their matching bidons from. NNNick fiddled with his Garmin sensor on the rear stay until the Trek owners club pointed out “don’t those things have a Duotrap?”. Look it up if you’re in envy. You should be. 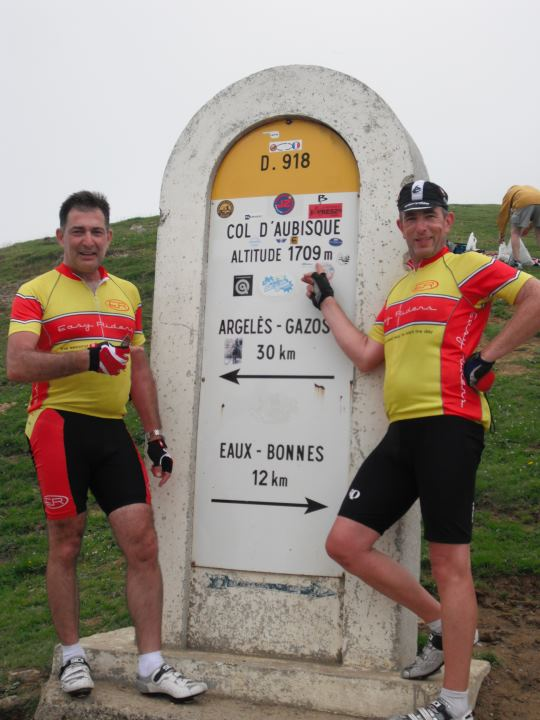 Out we headed towards the airport and noticed we also had our good mate Pete Kemp (from Bowrals and Gongs past) aboard, fresh climbing legs from Les Dix Alps, and equipped with backward facing camera to catch anyone workshy to present to the judiciary. Look forward to any footage Pete unless I’m in it. ER’s were unfortunately too late to nab our Scott from the Renegade peloton; great to see you out there mate and consider yourself contracted to ER next year…. First stop unexpected at a servo in Sutherland to unload the bladder, then onwards to Stanwell Tops, then into Gong proper. Pace was OK if not a bit slower than expected, and stops a lot longer. No complaints, we’ll bank any excess energy for that hill up the road…..
A different route to prior years around Albion Park to the servo stop just before Macquarie Pass proper. Everyone consulted their “BT’s Pocket Guide to Nutrition before busting your…self up a hill”, and on we headed. Into the climb proper and we each settled into our own rhythm as best we could with c140km in the legs by then for some 12km to the Pie Shop at Robertson, although the last 3km of those are better described as “undulating”, and not Drastique’s “undulations” between Thredbo and Khancoban either. NNNick and I found ourselves following a decent wheel up the hill – who later turned out to be a mate of mine from Uni that I hadn’t seen for 20-odd years. He managed to pull away (annoyingly) in the last 2km before it flattened out, with Nick and I coming in together. Everyone finished strongly, not a bead of sweat to be found one some (Andy, Graham) and some wishing they’d inhaled more water before setting out (VD). The final 30km or so into Bowral were pretty easy going for all – no-one looking particularly fatigued by the time we got to Bowral even allowing for the extra 5km we must have done to locate The Don’s home ground. A great effort by all combatants; proud to be one of the crowd; ER strength goes from strength to strength it seems…..PR’s all over the place per Strava. Edward (a smaller version of Stealth) present and waiting at the finish line with football in hand to offer some drop punts around the oval to loosen up any stiff legs – much appreciated and I won’t tell your Dad all that stuff you told me about his antics mate…until the ER Xmas Party. Next outing the Gong Ride, and G2GGvG for those wanting an express ticket southbound and to stretch their legs on Bulli Pass on the return. Spreadsheet pending. This entry was posted in Other Ride Reports on 23 September 2012 by Drastique. A swiftish attack of the hills of death, followed by the usual regroup at Roseville, saw numbers swell to about 25..YHC was distracted from a departure tally by Bucky who protested loud and long about the new adage to his ride name, of “the grate”..Bucky the grate..harsh as his encounter with the wheel eating hazard did not include a trip to Casualty and plaster of paris jacket..
One of our Ute brethren went seeking attention today, the 30 seconds it takes the peloton to pass the length of Hill Street being too much of a delay, our hapless driver tooting the horn initially and then when that did not make the peloton disappear, he then started hurling verbal assistance to the horn, and finally an ill timed acceleration over the double whites straight into the path of oncoming traffic..to which he then just pulled into the middle of the peloton..and attempted a turn into Victoria St..Lunchie was in the way so a swerve to avoid followed by an intentional swerve back in to intimidate ensued…at this point the peloton swooped, our Ute was quickly surrounded and let’s just say a few raised voices…not a “best “ way to start the day by any means..
Not much else to report..1/4 KOM …Schleck finding a green when off the front ( I think a case of a tail wagging the dogma ) to claim first rights at the B&T.. magnificent mornings ride in, ( utes aside ) it really does not get better than this..
PS DLHK will crow about the RBD and never meeting the uncouth on his commute… can the juggernaut of the ER peloton be persuaded to leave the OTP for a leafier path?..your comments on the subject eagerly anticipated. Return bouts starting from 5pm, they should be tapering to a gentile crystal crank in preparation for the Bowral trip on the weekend. This entry was posted in Commute Reports on 20 September 2012 by BT. Originally English, was transported here in the mid eighties, and brought tears to Bob Hawke’s eyes as he swore me in as an Aussie citizen on the Bicentennial Australia Day. ( Well it was actually September that year but I like the story ) Known to stretch as much value out of as few facts as possible my role as Scribe seems to suit ER purposes well.. Any serious attempt at acquiring wealth has been thwarted by expensive hobbies, Aviation first love, unrequited and divorced once children and mortgage took first precedence.. Divorce…what more needs to be said, and now flirting with the mistress Cycling. See above. Very few things can deliver so much pleasure for so little cost. When gym membership is a stretch too far after mortgage and kids, there is nothing like a good hard ride to put a spring back into your strides. I was pedalling on the Pacific Highway and was overtaken by HB, once he heard I was heading into town, there was no getting away, I had to follow him and onto the back of the ER peloton, ( then consisting of about 5 regular riders ).. then spent the next twelve months being coached by Satnav to hang in there..no one could be as slow as me forever. Giant CXR3 …Silver, flat bar, mudguards, panniers, retired to a life of leisure and currently accompanies me to the shops for the weekly groceries..named Doris by Bullet at a time when irreverent and non PC jokes were rare. Giant TCR Advanced1..black, imported from the UK this was a first serious carbon fibre bike. It catapulted me from the rear of the peloton all the way to about half way up the ranks..so shot to mediocrity. Once I went to have a proper bike fitting it was soon described as “too big” and the search for a more shapely and svelte model was on, reluctantly I set foot inside the Turramurra Cyclery, only to be released once they had introduced me to a new Italian, with curves in all right places, and price tag YHC could actually afford. Wilier Izoard XP 2010 …White with go faster red stripes on it..loves to be ridden in the French countryside, has mounted some of the iconic TDF cols, and is now earning its keep along the one true path. 6, Tell us a riding story. One frosty morning in June a couple of years ago, I was heading to Gordon as one does, and as it was dark, bitterly cold, I decided to kick the pace up a notch to generate a little heat..on the slope off the railway bridge going towards Asquith, I realised there was a car on a collision course coming in from the left, so as I had the give way sign, ( since changed to a stop sign ) I hit the brakes hard…both wheels locked up no braking, somehow I managed to turn side on and put a BT shaped dent into the driver’s side door…ended up bouncing off, unable to get feet out of the cleats, and hit the deck with the other hip…with 2 “dead legs” I was assisted off the bike by two passers by, and the driver…they wanted to call the ambos but I had already called the wife …one of the most difficult conversations to have while slightly concussed, shocked and with a possible deep vein thrombosis swelling nicely.. I also enjoy reading books / studies about diet, food, nutrition, and will talk ad nauseam on this very subject given half a chance.. This entry was posted in Rider of the Week on 17 September 2012 by Drastique. I am 41 years old and 6’2” tall. I am not keen on Baked Beans which means I am often ostracised by my family at the dinner table. Between Christmas and New Year last year the widening of the Boundary Road rail bridge meant there were no train services to the City. Welchy and I struck out on our bikes and made heavy work of the light vacation traffic. I could not be bothered to get out of the habit of riding and have cycled ever since. SatNav rode beside me as I struggled up a hill one evening and suggested I could be breathless in good company. I have a silver road bike and a heavy grey one. Neither of them have nicknames yet. Back in the UK, a week before our second son was born, I was rushing home. I executed a 90 degree right hand bend too quickly and came off and broke my arm. It threw our birthing plans out a bit as I could not drive Suzanne to the hospital so she ended up having William at home, on the bed where it all started. Does that qualify for two riding stories ? Perhaps consider leaving home a few minutes earlier ? This entry was posted in Rider of the Week on 16 September 2012 by Drastique. A superlative morning for a ride in, dawn broke in a typical flashy display of colour, the high clouds providing an artistic canvass to present a Michangelic scene across the skies over the north shore. The only thing missing were a couple of naked blokes trying to shake hands. No heater required so no shock on exit into the carpark, YHC even neglecting to don extra layers, although with a winter coat un-moulted you would not really have noticed. Crossing the road to find Comet already for a swift departure it was not long before I volunteered some more chosen facts about food, diet and some overlooked but salient data it may have been only five minutes before the peloton started arriving but Comet looked ready to bail …I must be getting old usually it only takes me a minute to reach that point. Much the same as usual, numbers tipping into the early 20’s, smattering of old faces, plenty of new ones, a sea of egg and tomato jersey’s launching forth onto the one true path, following the captain’s song sheet, managing to maintain poise and repartee in equal measure, today’s ride in was all pleasure and no pain..not one to have missed. Brownie rolled into the lantern rouge carriage as we rolled out, crystal cranking for a nice little stroll before tomorrow’s display of explosive power and aggression. If we can’t all manage to be at Dunc Grey stadium in person, I am sure there will be many there in spirit. Road discipline was good, with the numbers it looked ( from my usual afterdeck perspective ) like a well oiled machine..lights, signals, manoeuvres conducted as per the RMS guidelines..regroups and making sure all aboard would have passed the Gooses exacting standards. Pace was to the Captain’s preference. KOM ..will call it as ¼ ( default while BamBam and Drastic are no shows ) unless the real KOM would stand up. Shredded again through the North Sydney lights, regrouped for a last ditch sprint for coffee..and blessed once more with an attentive barista, 20 odd deliveries in swift and efficient service. Perfect. Departures may be in less than clear conditions, forecast is for ride with a little precipitation, hard to believe but we could do with a bit of rain. 5 – 5:15 – 5:30 6pm all available. 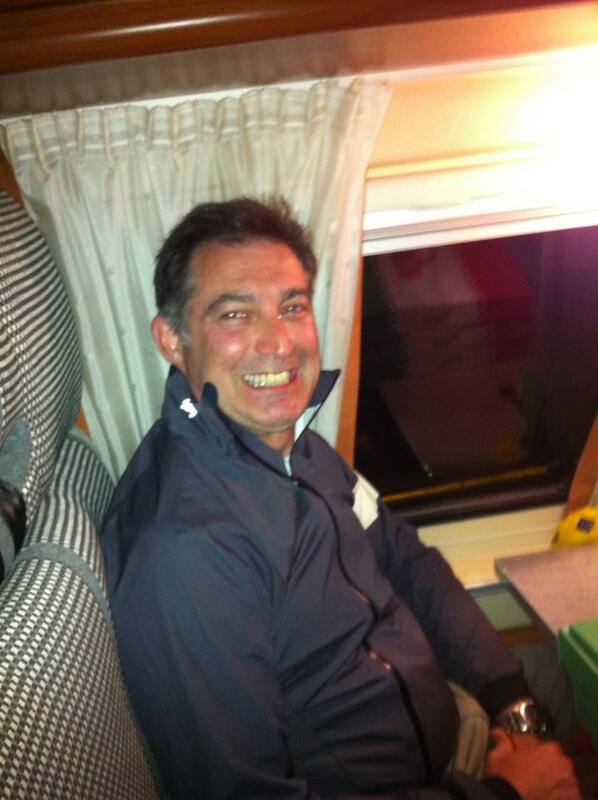 This entry was posted in Commute Reports on 13 September 2012 by BT.